Accepting online credit card payments means that you are able to attract a much larger target audience of customers. The majority of consumers and business customers prefer to make online credit card payments because they know this is a secure payment method. They have a credit card company behind them should any of their online purchases not go right. As a business owner, you want to make sure you work with a payment company that makes accepting online credit card payments as easy and affordable as possible. 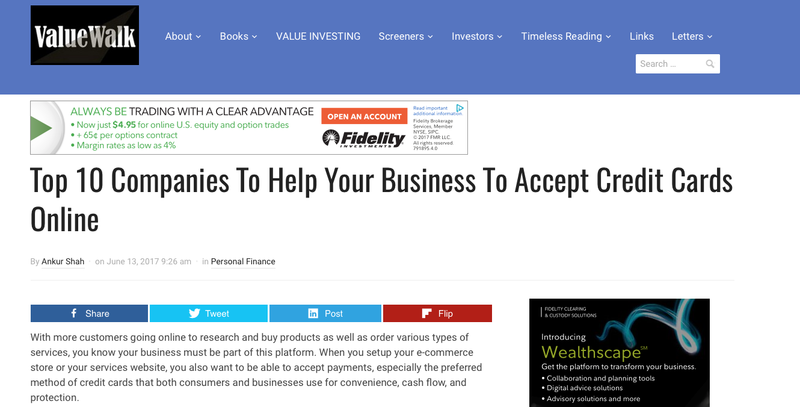 ValueWalk developed a list of the top ten companies that fit their criteria as the best online credit card payments providers. The criteria included cost and fee schedules, ease of use, transparency, security, compliance and features. Due was listed as a top online credit card payments company for its straight 2.8% rate to process Visa, MasterCard, American Express, and Discover on a domestic and international level, no hidden costs or monthly fees, no per transaction cost, and simple integration. Due also offers live account monitoring, fraud prevention tools, chargeback protection, reports and analytics, and deposit on demand. Also listed as a top online credit card payments company were Flint, Flagship Merchant Services, Cayan and more. You can read the original article here. It’s important to keep track of the costs that many online credit card payments companies add into offering this payment method. Here is a tutorial on credit card fees that many payment providers try to get you to pay.